Ratio calculation is an important part in Product designer. It is used to specify the compatibility between the real size of the product and the product size on the screen. The correct size of an image which you will get for printing depends on your correct ratio calculation. You need to calculate a ratio for every product with enabled Product designer tool. Ratio field is located on editing product page -> "Product designer" tab -> 'Settings" button. In general, Ratio shows the amount of pixels in the unit of length for a current product. Unit of length can be inch or millimetre. Specify a unit of length which is the most comfortable for you in the General options of Product designer (Administration -> Add-ons -> Product designer add-on -> Edit). 1. 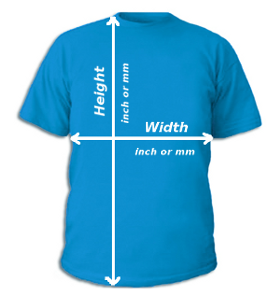 The real dimensions of your product - width and height in inches or millimetres. 2. Digital dimensions of your product image - width and height in pixels (As a rule, you can view these dimensions in any photo editor). Please note! For correct ratio calculation your real product and the image of this product should resemble each other. It means that the image should be a smaller copy (photo) of a real product. Compare "width" and "height" Ratio and take a bigger number, it will be the final Ratio. Note! It is possible to use only five digits after the decimal point for Ratio in Product designer that is why all final calculations which you will see after adding a canvas will have a little inaccurancy. For example, you sell custom t-shirts. 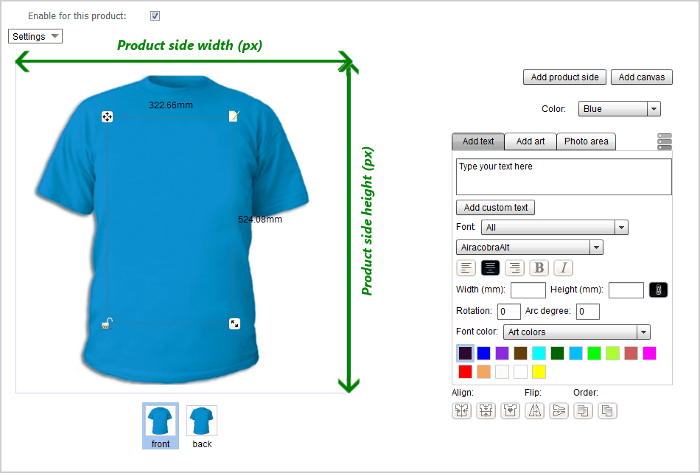 Take a real t-shirt where you will print design and measure it. See the pictute on the right how to take measures. Note! Since t-shirts have different sizes "S", "M", "L", etc., and if you have one product for personalization with the "Size" option to choose, you should take the biggest T-shirt as an etalon to measure the real dimensions. In this case, it will be easy to adjust a printable image for smaller t-shirts. Or you can make separate products for every t-shirt size. 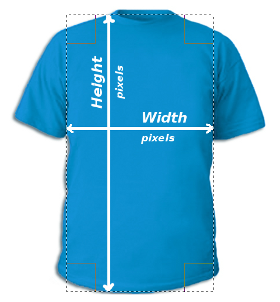 We've made a t-shirt image in Adobe Photoshop, select the necessary zone with a rectangular tool and got the necessary dimensions (they are shown automatically in a photo editor). Now, let's calculate the Ratio. Our default unit of length is millimetre. We see that "width" Ratio and "height" Ratio are a little different, it's a normal thing and it's always better to use a bigger number. Thus, the Ratio for our T-shirt is 1.86507. This article is written to show a formula for Ratio calculation and to demonstrate how it works for a T-shirt. The same formula applies for other products. It is possible to calculate the exact Ratio for such products which digital dimensions and real dimensions coincide (small products like mugs, mobile phone cases, etc. ).